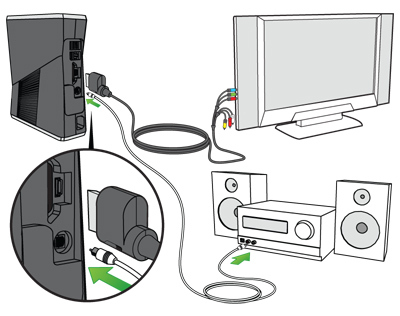 Review the information below to learn how to connect your Xbox 360 E, Xbox 360 S, or Original Xbox 360 console to a sound system. A standard stereo audio cable that connects your TV directly to your sound system. Cable requirements can vary by manufacturer; see your TV manual for details about how to output audio to an external source. o A standard stereo audio cable and an HDMI audio adapter. Note The Xbox 360 S has a built-in S/PDIF (optical audio) port for the digital audio cable. An HDMI audio adapter is optional if needed for your system. A standard stereo audio cable and an HDMI audio adapter. Using a standard stereo audio cable recommended by the manufacturer of your TV, connect one end of the cable to the output port on your TV. Connect the other end of the cable to the audio input port on your receiver. Connect the other end of the digital audio cable to the digital audio input on your receiver. 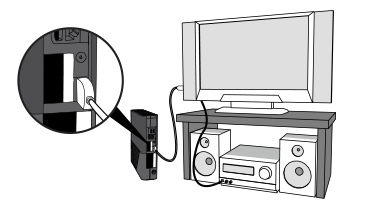 Leave the A/V cable connected to your TV or monitor for video. Unplug the audio connectors from your TV or monitor. Leave the HDMI cable connected to your TV or monitor for video. Connect the HDMI audio adapter to the A/V port on the console. Connect one end of the digital audio cable to the HDMI audio adapter. Connect the other end of the digital audio cable to the digital audio input in your receiver. Connect one end of the digital audio cable to the TOSLINK port on the A/V cable. Connect the white and red connectors on the stereo audio cable to the corresponding ports on the HDMI audio adapter. Connect the connectors on the other end of the stereo audio cable to the stereo input ports on your receiver. Would you like to contact Support regarding the "Connect your Xbox 360 console to a sound system" issue you were reading about or a different issue?